So it is that time of the month again and I can’t even believe how fast it has gone. Can you? As usual, at the end of the month I bring you my monthly favourites and, again, most of them are makeup related as that is what I bought the most this last month (shame on me). If you want to purchase the items, just click on the name and it will re-direct you to Boots website. So… are you ready for it? I have mentioned this foundation previously here on the blog and also on instagram and twitter so it was more than obvious that this would be part of my February Favourites. This has been my go to foundation for everything. It does what is says in the packaging: “no transfer, no visible imperfections, no visible shine, no dry-out and no mask-effect” and also, it stays in place all day. The only place that I do see that it fades and transfers is on my chin because it is the part of my face that I touch the most (you know, while holding my head to write during those long, boring, night shifts for example). Apart from that, it does the job brilliantly and I guarantee you that. As you know I am a nurse and I do 12 to 13 hour shifts sometimes and my foundation lasts all shift and I always look nice and fresh. Many people comment on how flawless my skin looks and that I don’t even look tired so.. It is this foundation. I love it and I will, for sure, re-purchase again and again. This eye shadow palette has been my loved one, without a doubt. I use this everyday when I am doing my new everyday makeup routine. My favourite eye shadow is the fourth from the top row – a beautiful shimmery gold perfect for a glamorous everyday makeup look that you might have already seen if you follow me on Instagram. I love it. And also, it has the most amazing colors for a night smokey eye. I did a review on this palette here so go and have a look. I have been using this lotion since I came to Madeira (one week and something ago) and I have been loving it. It removes my makeup so easily and it smells lovely. I do use it to remove my eye makeup as there is no information to not do it but I do have to be careful because it does burn my eyes. But for now, I am still removing my eye makeup with this one because I am on holidays and I don’t have my Garnier Makeup Remover that I also love. So when I get home I will probably just use this one to remove my face makeup and use the Garnier one to remove my eye makeup. Otherwise, this Dolce & Gabanna lotion is fantastic. I really like how it leave my skin feeling really soft and smelling lovely. And I just noticed that this product is on sale at the Secret Sales website. Go for it! This is another product that came in my Cohorted Beauty Box and I am so thankful for it. Everything I look at it and see that it is a size sample I am so sad about it as I don’t want it to run out while I am out of the UK. It gives volume to my eyelashes beautifully and it separates them as no mascara has done it until now. I apply 2 or 3 coats of this mascara and I feel like I have long, long lashes. Another one that I already mentioned here on my blog. It is my savior when it comes to a perfect cat eye. I don’t have to say more about it. Just read my review clicking here, you won’t regret . I promise. I got this blush the same day that I got my foundation that I mentioned above and I don’t regret it. I bought it because I really needed one as my essence blush was running out and when I saw this one, I fell in love. It is a beautiful pink with a subtle amount of shimmer, barely noticeable but that makes all the difference. It has been my everyday blush not only because it is the only one I have (haha) but just because I feel that it is perfect and I don’t need any other blush in my life. That’s it. I have been loving these two lipsticks not on their own but as a combo. 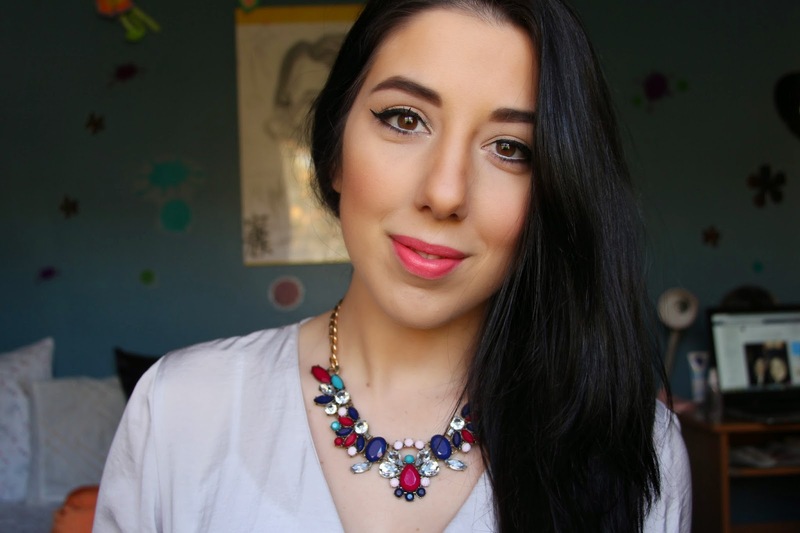 I apply the L’oreal Color Riche Lipstick in the shade 371 Pink Passion first, and then on top of that one, the CK lipstick in the shade Venus and it gives me a beautiful peachy pink, bright lipstick perfect for spring. And I know that it is not spring yet but here in Madeira the weather has been so nice, warm and sunny that I feel the need to wear a bright lipstick so.. these are the ones! Finishing the makeup section of these favourites, I thought I should share one photo of me wearing the majority of these products. One photo that I shared before but anyways, here it is. At least you can see how the foundation, blush and other things look on my skin. # H&M Skinny Jeans – I can’t actually find them on the website but they are pretty similar to these ones, except that it is regular waist instead of low. I don’t do low waist anymore! I love these jeans because the flatter my body shape and they go with everything. I love a light color jeans and these are the ones for me. # H&M Sunglasses – I got these sunglasses a few days ago. I love my River Island ones but I wanted to change and even if I didn’t change to something pretty dramatic and different, I still love them. A black, classic sunglasses that suit my face shape. I really like them! # Sony Foldable Headphones – These headphones have been my best friends during the flights and train journeys. And also, when I watch my series on my laptop and just listen to music while writting on the blog, just like I am doing now. Nice and clear sound and they are also gorgeous! I got the white ones and I love them. You just need to be careful when you wear foundation haha. 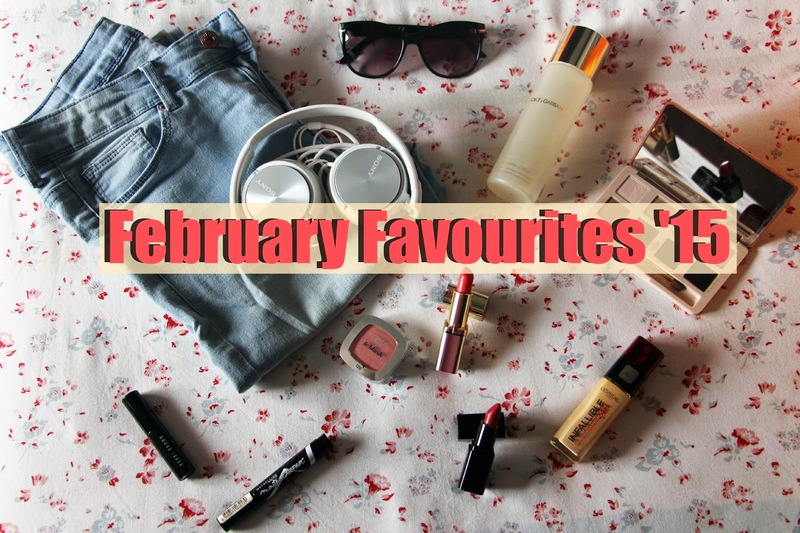 And this is it sunflowers, my February Favourites. I hope you liked this blogpost as much as I enjoyed to write it. I just love to ramble about the things that I love, am I the only one? What about you, what was your February Lover? Oh! I almost forgot. My song! My song of the month, the song that cheers me up and makes me act goofy and dance like there was no tomorrow. Here you go. Enjoy.